Pathology, the study of the nature of disease and its causes and effects, plays a significant role in the diagnosis of asbestos-related cancers. Studying the way cancer looks and behaves in the body helps doctors provide an accurate diagnosis and develop treatment plans for patients. Medical oncologist Dr. Tirrell Johnson explains pathology and the important role it plays in mesothelioma cancer progression. Pathologists are doctors who specialize in analyzing diseased tissue to diagnose health conditions such as cancer. These doctors study the alteration of cells and the consequences of changes. Pathologists who specialize in the diagnosis of mesothelioma are experts in the physical characteristics of asbestos-related tumors. They know how to differentiate mesothelioma from other cancers through examination under a microscope, which is a crucial step to diagnosing and treating the cancer. Histology involves the study of tissue samples obtained through a biopsy. 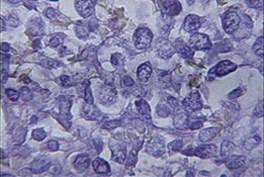 Histopathology specifically refers to the study of the cells in diseased tissue. For mesothelioma, actual tissue from tumors is usually obtained through a thoracoscopy — a type of biopsy that is 98 percent accurate at diagnosing the cancer. Examining tumor cells is the only way to confirm what kind of cancer is present. A subspecialty of histology known as immunohistochemistry uses special stains to reveal more details about a tumor that helps doctors treat it more efficiently. Medical oncologist Dr. Tirrell Johnson explains the role of pathology in determining malignant cells. Using histology, pathologists classify mesothelioma cells into three general types based on what the cells look like under a microscope: epithelioid, sarcomatoid or biphasic (mixed). Epithelioid cells are polygonal, cuboidal or oval in shape and can often mimic noncancerous mesothelial cells. Sarcomatoid mesotheliomas are spindle shaped. Biphasic tumors contain both epithelioid and sarcomatoid cells. Aside from these major cell types, there are a number of variants within these categories, including deciduoid, desmoplastic, lymphohistiocytoid and small-cell mesothelioma. We can connect you or a loved one with top mesothelioma doctors and cancer centers in your area. Immunohistochemistry is a type of staining technique used by histopathologists. This technique uses antibodies applied to tissue samples on a slide. Pathologists can then observe the characteristics of cellular proteins as they react to the antibodies. The International Mesothelioma Interest Group (IMIG) states a definitive diagnosis of asbestos cancer must include immunohistochemical testing. One highly useful stain is an antibody called pancytokeratin. This stain will almost always be positive in asbestos-related tumors and is highly reliable for a mesothelioma diagnosis. However, because most of these stains lack some accuracy as single stains, doctors use an entire panel of antibodies made up of epithelial markers and mesothelial markers. Immunohistochemistry stains can be used in cytology, although the methods for preparation differ from those in histology that use actual tissue samples. Generally, immunohistochemistry is more reliable when used in histology than cytology. Cytology studies cells from fluids or surface scrapings without obtaining actual tissue samples. Pathologists can gather pleural fluid, called a pleural effusion, from a patient suspected of having pleural cancer. It is taken from the pleural space outside of the lung using a fine needle aspiration. This method is less expensive and test results are available sooner than tissue biopsies. Pathologists provide crucial information for a mesothelioma diagnosis, including the tumor’s cell type and whether or not the cancer has spread to the lymph nodes. Cytology can identify the presence of an individual malignant cancerous cell, but cytology cannot differentiate between a malignant tumor, a cancer that has not yet invaded surrounding tissues and an invasive tumor. Histological testing of tumor tissue is still needed to confirm a mesothelioma diagnosis. The exact role of cytology in the diagnosis of mesothelioma is still debated by the medical community. IMIG recommends cytologic tests be supported by tumor tissue tests, imaging scans and other clinical data. The histologic features of peritoneal mesothelioma are similar to primary pleural tumors, but the biphasic cell type is less common, which is important to note because this cell type has a poor prognosis. Additionally, the well-differentiated papillary mesothelioma cell subtype is more frequently seen in the peritoneum (lining of the abdomen) than the pleura. These cells are smooth, contoured and lack nucleoli. This cell type also has an excellent prognosis, although it has a tendency to reoccur. Baldi, A. (Ed.). (2008). Mesothelioma from bench side to clinic. New York: Nova Science Publishers, Inc.